The KBS Returns module provides an efficient method of controlling the flow of returned goods from customers. Management controls ensure that requests for return are checked by management. Quarantine warehouses can be set up. Paper work automatically generated and financial transactions, such as credit and debit notes, automatically raised. Management/Supervisor control of the whole process. Documentation produced automatically- minimal handling. Good customer service by having all data to hand. Ensures no 'invalid' returns by batch/serial trace. Impress suppliers with accuracy and timely information. Data available to analyse causes and patterns. Controlled procedure from Request to Receipt. Supervisor Control throughout, if required. Checks on validity of returned items. Returns to Suppliers with documentation. 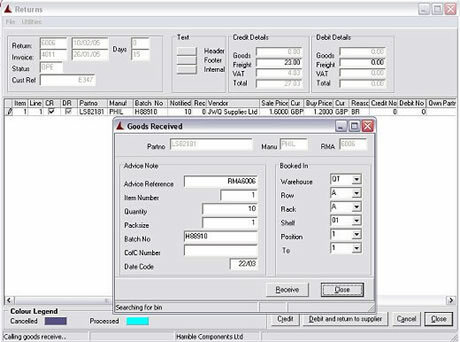 Debit notes to suppliers generated. Returns module receiving returned items back to stock.